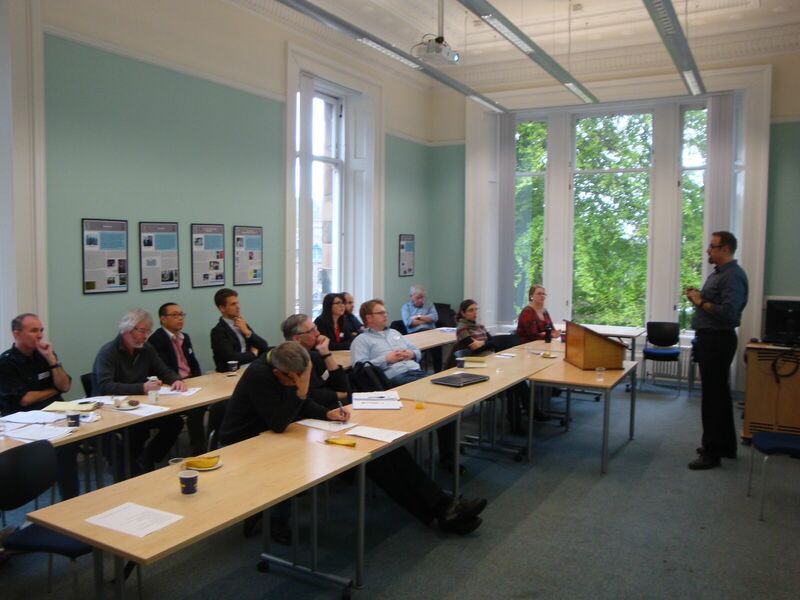 Glasgow FRESH meeting: “Migration, Entrepreneurship and Social Change”. On the 2nd of June 2015 Marc Di Tommasi and Zoi Pittaki organized a FRESH meeting in Glasgow on the theme “Migration, Entrepreneurship and Social Change”. The University of Glasgow hosted the event and let us use as a venue the historical Lilybank House, a lovely building constructed in the 1830s and extended by Alexander "Greek" Thomson in the 1860s. The rationale behind the event has been realising the deep connections and intersections between migration and entrepreneurship, and wanting to explore this space with a particular attention to social change. This influenced the very structure of the conference with three different sessions each dedicated to the three theoretical linchpins. The first session, chaired by Iida Saarinen from the University of Edinburgh, was dedicated to migration with two interesting papers that nicely set the tone for the rest of the day. First of all Claudia Rei, from Vanderbilt University of Nashville, Tennessee, posited extremely interesting methodological questions in her search for the “Historical counterfactual” to the Jewish diaspora caused by Nazi expansion. Then Jimyong Lim, from King’s College, London, managed to overcome the disappearance of his laptop and delivered a talk on the racist anti-Japanese movement that prospered in the United States at the turn of the twentieth century. After the delegates took a well-deserved coffee break they reconvened for the migration keynote speech, where Professor Richard Smith, from the University of Cambridge, summed up the long history of the “urban graveyard” debate and presented the latest historical demography data from the London parish of St. Martin in the field. The subsequent debate, long and lively, further explored the concepts introduced. After a lunch break where we all had a change to enjoy the quite tasty Glasgow hospitality we all reconvened for the entrepreneurship keynote speech. Professor Dan Wadhwani, from the University of the Pacific, expounded on the theoretical framework behind the concept of entrepreneurship and the role played by the migrants in a very well received talk. This was followed immediately by the session on Entrepreneurship, chaired by Jimyong Lim, from King’s College, London. First of all Valentina Sgro, from the Italian Università degli Studi del Sannio, with her co-author Vittoria Ferrandino stuck home, explored the rich and eventful business history of the Italian food industry in the USA. The audience was enthralled in discovering the hidden Italian origins of many famous American brands, like Mr. Peanut. Then Peter Bent, from the University of Oxford, took us in an entirely different direction with a quantitative analysis, helped by his advanced econometrics skills, of financial crises in the gold standard era. His hypothesis on the role of capital flows spurned serious interest from the economists in the audience. After the last coffee break, surely these historians need a lot of coffee to get going, the third and final session started. This session, chaired by Peter Bent, from the University of Oxford, was dedicated to Social Change and, in the intention of the organisers, helped to pull together the various strands of the conference by concentrating on the effects on the social sphere. First of all Mathias Blum, from Queen’s University, Belfast, presented Irish anthropometric data from the period of the “potato famine”. The surprising results, that the Irish which not migrated displayed greater heights and so greater living standards, prompted a lively discussion with many different explanation proposed by the audience. 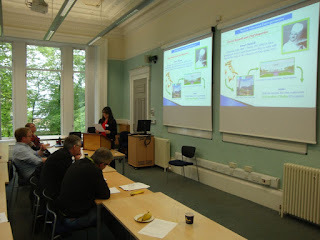 The last paper of the conference was presented by Iida Saarinen from the University of Edinburgh, and it dealt with the life histories of the Scottish Roman Catholic seminarians and how to complete their studies they had to spend an exceptionally long period abroad. This had an obvious influence on their outlook and therefore on their pastoral activity when they came back to Scotland. With the end of the conference proper a lovely dinner followed where the delegates sampled more of the Scottish cuisine and explored in an informal setting some of the themes of the long day. This event wouldn’t have been possible without the fundamental financial support of the Economic History Society, the Centre for Business History in Scotland and the European Historical Economics Society. However, despite the gravity of this catastrophe, there is a lack of detailed research based on archival data. This is mainly because the historical records have been scattered until recently. Following a reorganization of China’s First Historical Archives and the instalment of a dedicated disaster section, though, researching particular catastrophes has become feasible for the first time. Therefore, in a recent EHES working paper Ni Yuping of Tsinghua University and Martin Uebele from the University of Groningen are able to present new archival evidence about this major disaster. Figure 1. Share of counties flooded in 1823. Apart from the sheer size the 1823 flood mattered in two more ways: First, there is a debate about the moral nature of the Qing Empire under the pretext that a Confucian ruler would have to care for his people especially in times of dearth. However, as principal-agent problems grow with the size of a pre-modern state, corruption might easily undermine even the most humane intentions of a state and could potentially turn it into the exact opposite. Evidence for this is plentiful (Will 1990, Shiue 2004), and has made its way into the survey literature (Ó Gráda 2007, p. 16). But given the limited state of archival evidence, can we confirm or refute statements made in literature with our new data? Chiefly, our sources tell how much was spent for each province on various items of relief, from direct payments in silver to food shipments, and water infrastructure repairs, plus the various items of tax relief. Adding everything up and dividing the amount in silver by 80 million we find that spending per capita was sizable, even when compared to per capita payments in Europe: for example during the Irish famine (1845-49). But did it actually reach the provinces in need or was the money regularly embezzled? Quantitative research on this has been provided by Carol Shiue (2004). Her data covers the 18th century and mainly contains the information if a province received disaster relief or not. Combining this with an extreme weather indicator from another source she finds no evidence that relief depended on weather events. Alternatively, she provides a theory that relief would rather be distributed due to military or political goals leading to moral hazard at the lower levels of administration. Figure 2: Relation of tax relief and weather index, Chinese provinces, 1823. The difference between her and our data is that we actually do know how much relief was spent in each province, and we can show that provinces with more flooded counties received more relief (Figure 2). So if the same distribution rules applied in this specific year 1823 were also used in the 18th century, her argument about no relationship between disaster and relief would not hold. The second important topic is that early in the 19th century in several countries around the world the foundations for modern economic growth were established (see an earlier blog post on paved road building in Westphalia, 1820s-1850s by one of the authors; Gallardo and Uebele 2015). To some extent this rested on public investments and went hand in hand with reforms of the bureaucracy, but to what extent was this possible in China at this time? Probably the Qing central state’s provision of short-term disaster relief might have been an obstacle to growth because the government’s funds were exhausted and did not suffice for substantial long-term investments. 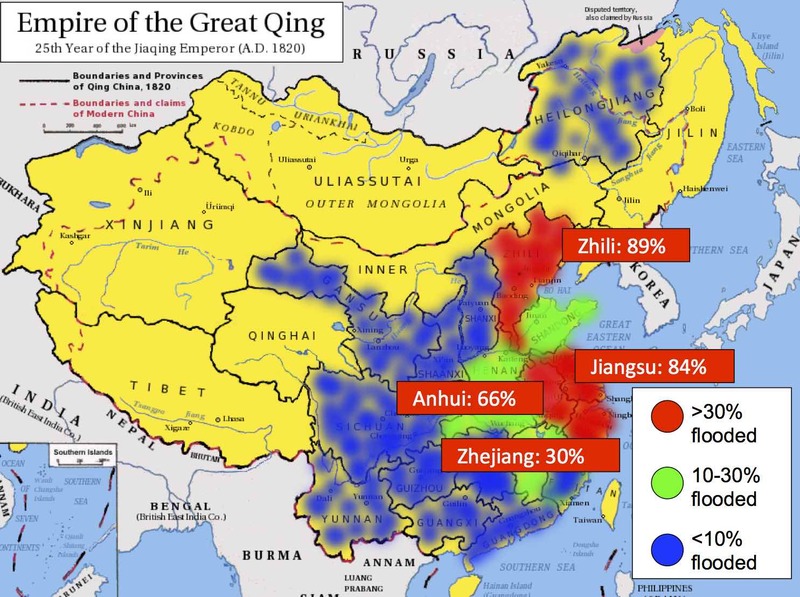 This could explain the “Daoguang Depression,” the secular lack of economic growth experienced in the first half of the 19th century. We find that the total spending in 1823 amounted to about half of the state’s annual tax income. This is because spending was large, but also because the Chinese state was small. Its tax revenue was maybe 1-2 percent of GDP compared for example to Britain where it amounted to at least 10 percent of GDP. Bearing in mind the internal and external security challenges such as the Taiping Rebellion and the Opium Wars, we conclude that the capacity for further investments in infrastructure or bureaucratic reform was surely limited and may have contributed to China’s lack of economic growth. Uebele, Martin and Daniel Gallardo-Albarrán (2015): “Paving the way to modernity: Prussian roads and grain market integration in Westphalia, 1821-1855,” Scandinavian Economic History Review 63 (1): 69-92. Ó Gráda, Cormac (2007): “Making famine history,” Journal of Economic Literature, 45 (1): 5-38. For most of the sixteenth century, Spanish political might rose together with a sustained and intense economic development, allowing the country to remain among the most affluent nations of Europe. However, with the turn of the century economic growth halted, and was followed by a rapid decline. The crisis of the seventeenth century was particularly hard with the Iberian economy that only recovered significant growth levels during the first years of the eighteenth century. As a consequence, Spain lost ground with the leading economies of Europe and became a secondary power not just in political terms but also in economic ones. What were the roots of the little divergence between Spain and the north of Europe? What was the role played by the agricultural sector? In a new EHES working paper, Carlos Álvarez-Nogal, Leandro Prados de la Escosura and Carlos Santiago-Caballero analyse the evolution of Spanish agriculture between 1400 and 1800, using an extensive database of tithes to reproduce the changes experienced by the primary sector. 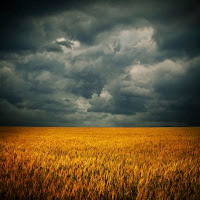 The results suggest that agriculture played a significant role explaining the little divergence, experienced between Spain and the leading economies in Western Europe during the late modern age. Stored in ecclesiastical archives for centuries, tithe records are among the few direct accounts of agrarian production for preindustrial times, and have been widely used by economic historians to estimate the evolution of the primary sector in the very long run. The historical presence and power of the Catholic Church in Spain, had positive externalities for economic historians that have at their disposal tithe records that are generous both in geographical and chronological terms. The tithe was one of the most important taxes in preindustrial Spain for the Church – and other authorities - that received it and for the producers who suffered it. It usually represented a ten per cent of total output that had usually to be paid when the product had been harvested. Virtually all agrarian production was taxed, from livestock to grain, wine, olive oil or honey. Even the new crops like maize that arrived from the New World were quickly introduced by the church in the list of taxable products. This paper collected an extensive dataset of tithes at local and regional levels between the fifteenth and the eighteenth centuries that were unified to estimate the evolution of agrarian production in Spain in the very long run. The results show that output per head reached its maximum levels in the mid fifteenth century and remained high until the late sixteenth century, suffering a severe contraction between 1570 and 1590, a period followed by a milder deterioration up to 1650. Although a small recovery took place between the late seventeenth century and the mid eighteenth century, the following decades were characterized by a new fall, reaching output per capita its minimum around 1800. Therefore, Spanish agriculture moved from a relatively high path to a lower one that persisted at least until the beginning of the Peninsular War. The results using a direct estimation like tithe records coincide with those obtained by Alvarez-Nogal and Prados de la Escosura (2013) using an indirect estimation though a demand function. Agricultural output per head (Tithes and Demand approach) and population, 1400-1800 (decadal averages in logs) (1790/99=100). The authors believe that the intense collapse that took place in the late sixteenth century was consequence of urban and international demand contraction, that resulted from the collapse of domestic markets, monetary instability, and war in Iberia. As consequence incentives to produce for the market decreased as did the intensive use of labour and land. As a result, the land rent-wage ratio contracted all the way to the 1670s, even when real wage rates continued to decline until the 1640s, and only recovered in a sustained way since the 1720s. The periods of agrarian contraction also coincide with the two largest climatic oscillations experienced in Spain, the Initial Oscillation between 1570 and 1640 and the Maldá Anomaly between 1760 and 1800. Agrarian production per head and population moved together up to 1750, suggesting the existence of a land abundant frontier economy until the mid eighteenth century. It was only during the second half of the eighteenth century when the results seem to indicate the existence of a Malthusian pattern. During most of the modern age, Spain lost economic ground with the rest of North-Western Europe. Far from being able to compensate part of the gap, Spanish agriculture contributed to the little divergence between north-western and southern Europe. 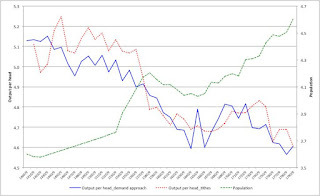 Long-run trends in agricultural output per head between Spain and Britain show that agriculture fuelled the increasing gap between both powers. 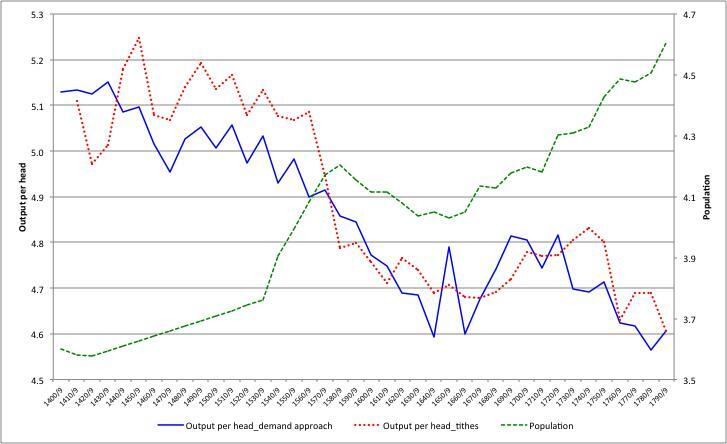 In Spain output per head fell dramatically after 1570 and did it again during the second half of the eighteenth century. By 1800 output per head was considerably lower than in the late fifteenth century. On the other hand, output per head in Britain exhibits a mild U shape with the levels of 1450 already recovered in the 1770s and overcome by 1800. While in Spain agriculture employed about two-thirds of the male labour force by the late eighteenth century – and four fifths by 1500 – in Britain the numbers went down to just over one-third in 1801 from two-thirds in 1522 (Broadberry et al., 2014). Labour productivity in Spain suffered a long-run recline throughout the early modern age, while it showed a significant increase in the case of Britain. Therefore, the study concludes that far from being helpful, agriculture was a significant player in the little divergence experienced between north-western and southern Europe. 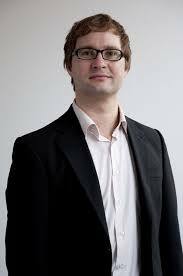 Carlos Santiago-Caballero, Associate Professor in Economic History at Universidad Carlos III de Madrid.